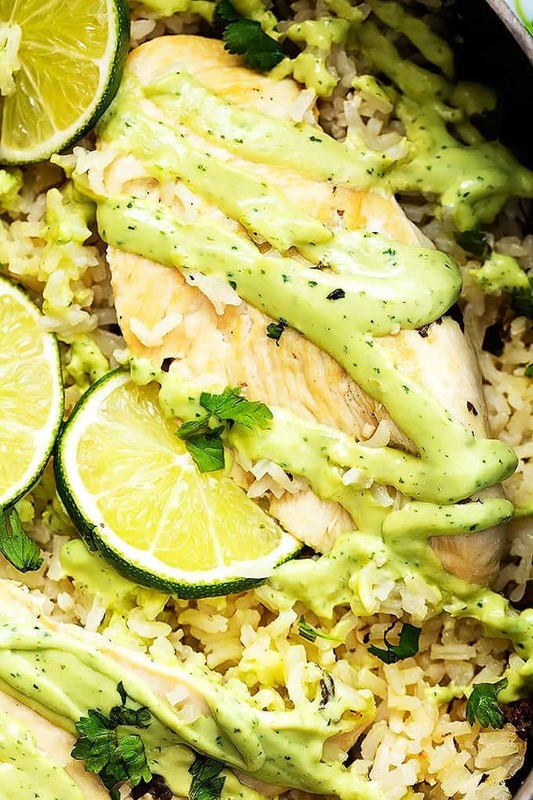 One Pot Cilantro Lime Chicken & Rice cooked in just 30 minutes, topped with creamy avocado sauce. It’s been too long. Way too long since a one pot meal has appeared on this here blog. So here it is. 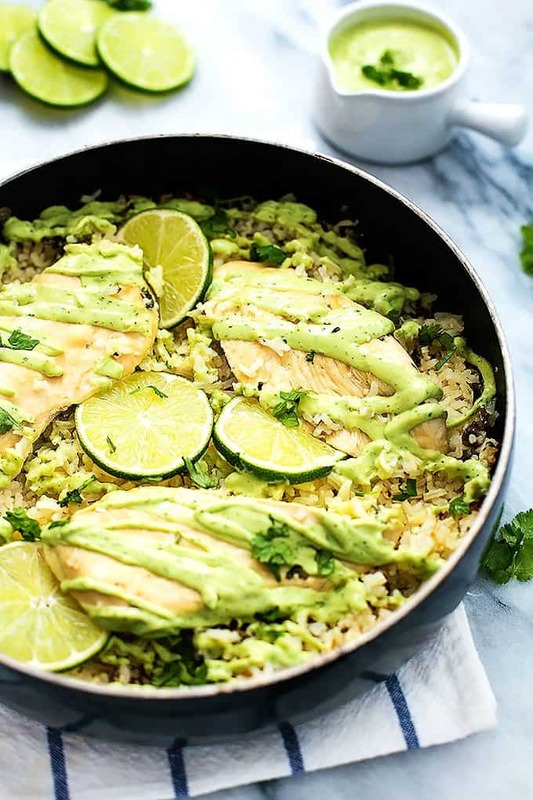 One pot cilantro lime chicken and rice. In 30 minutes. You’re welcome. So the sauce is optional. I mean not optional. What I mean is… technically you could make just the chicken and rice and be perfectly happy with your dinner. You really could. BUT what you really should do is make the sauce. Because it makes the dish ten times better. Nay, fifty times better. 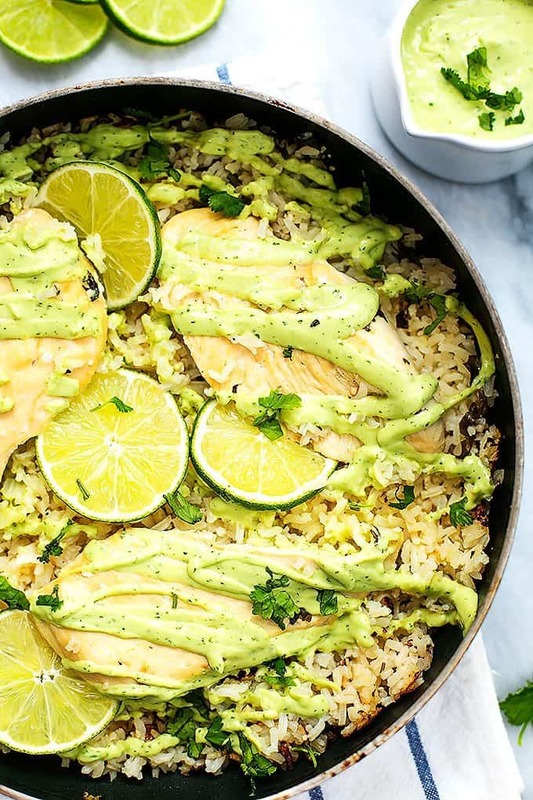 One of my most favorite and most popular dishes here on Creme de la Crumb is this —> one pot lemon herb chicken and rice, but when my husband slash official taste tester tried it for the first time I should have known he’d ask where the sauce was. We are sauce people – ranch with everything and the standard three packets of ketchup that come with every to-go order of fries is just NOT enough, why can’t you takeout people get that through your heads?? So when I made this cilantro lime chicken and rice I was prepared. I whipped up a super yummy 10 second cilantro + lime + avocado sauce to go over that chicken and rice and I am sooooooo glad that I did. So is my husband slash official taste tester. This whole one pot dish is what busy weeknight dreams are made of. So little effort, so much goodness to be had. One pot to clean up, plus it’s a main and a side all in one and you just can’t beat that because seriously, am I the only one who struggles with coming up with side dishes for your weekly menu? I tend to get excited about the main entree and totally space it on the side dishes so I have to throw something together at the last minute, and I will be perfectly honest… chips and salsa probably becomes a side dish to wayyyy too many of our dinners. But if you haven’t tried it alongside fettuccine alfredo you’re missing out p.s. 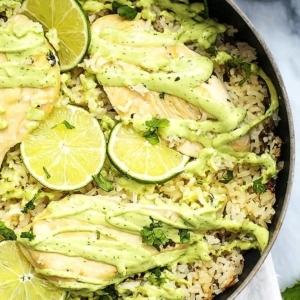 Cilantro lime chicken and rice cooked in one pot just 30 minutes, topped with creamy avocado sauce! Add butter to a large skillet (one that has a lid) and melt over medium heat. Once butter is melted, add chicken and cook 1-2 minutes on each side just until lightly browned. Transfer chicken to a plate. Add rice and garlic to pan and stir over medium heat for 1-2 minutes until garlic is fragrant. Add chicken broth, lime juice, and cilantro. Place chicken on top of the rice. Reduce heat to medium-low, cover and cook 25 minutes or until rice is fully cooked and liquid is absorbed. While chicken and rice are cooking, make the sauce. Add all ingredients to a food processor or blender and pulse until smooth. Add more lime juice or a little more milk if needed til pourable. Drizzle sauce over chicken and rice. Sprinkle with additional cilantro if desired and serve. I am a sauce person too! I LOVE the stuff! Also, I LOVE you pictures! They are awesome!!! 😀 And I love your blog! Keep up the great work! I made this for dinner – it was really good! The sauce was perfect, too. I made some pickled red onions to go with, too, and that was the perfect counter point to the richness. Thanks for the good recipe! Is there any way to make this with Brown rice? What changes would you make if so? Hi Jamie! 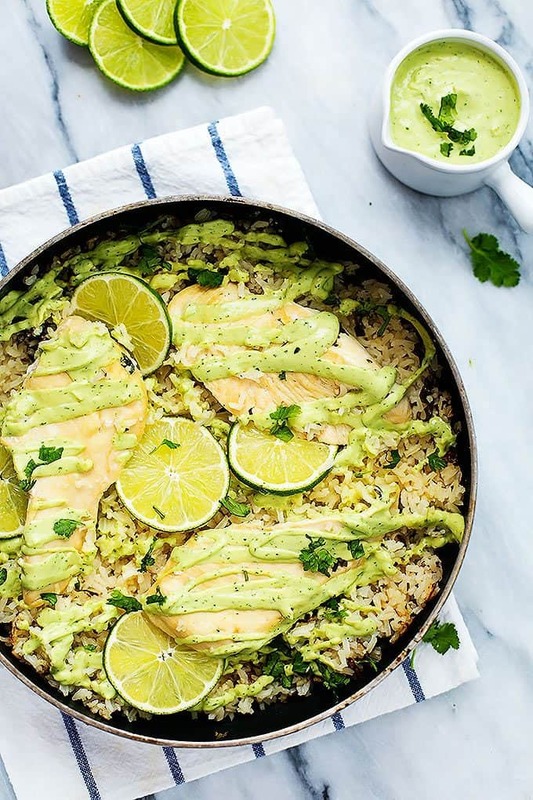 Yes you could make this with brown rice but you will need more liquid (maybe an extra 1/2-1 cup?) and longer cooking time. To keep from over-cooking the chicken I would wait 15 minutes to put the chicken in! What is the approximate weight of 4 chicken breasts? The breasts I buy from my local grocery store are huge – 5 breasts weighed just about 5lbs. Delicious recipes. Look gorgeous. But so many of us in the world work with metric measurements and your old-fashioned volumes and weights are baffling! Cups!? Could you put up both types of measure in your gorgeous dishes. We love the lemon counterpart (I’ve shared it with so many friends) so this line version was sure to be enjoyed too! I especially liked he sauce with it. Easy, ingredients in hand, and quick. Thank you! I guess we’re a bit confused…actually reduced the juice of lime to 2 1/2 limes and…wow, “pucker up!” It looked great, so we were very disappointed. Could only eat the chicken with the rice and sauce scraped off. 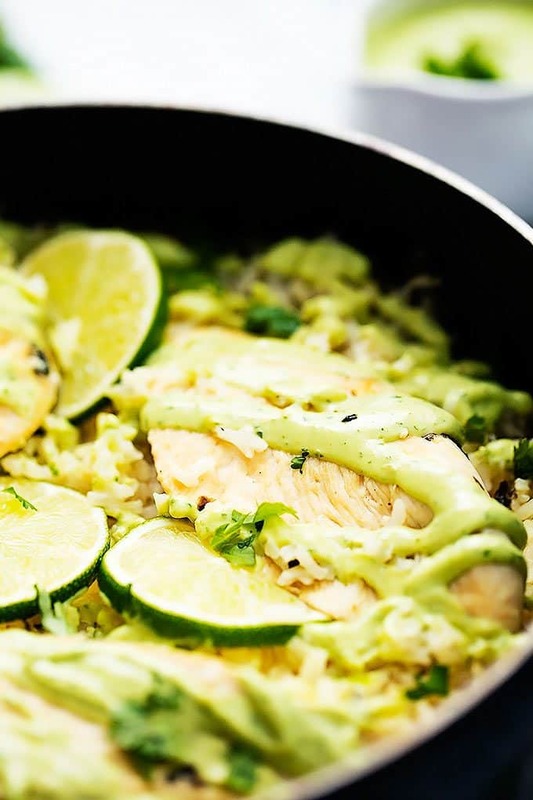 Looked back over recipe, but can’t figure out went went wrong…and we like lime too. The dish was great overall but I think we overdid it with the lime. Next time I will lighten up on the lime and maybe add a little more chicken broth. without avocado, how could you make the sauce? Yum! Yum! Yum! That sauce, I could use it for everything. Isn’t it delish?!? So glad you love it!! This post is almost a year old, but I found this on a BuzzFeed article, and I just have to say this is AMAZING! Im in love with the sauce. This is so tasty! I’ve made both this and the one pot lemon herb chicken and rice in the past week. I’d love to see more recipes like this! It looks really delish and I want to make this in the slow cooker for my work peeps. When would I add the rice to the slow cooker and what other adjustments should I make? This is my first comment on a recipe, ever! This dinner was too good to pass up the moment. So simple and easy, yet so flavorful. Made it for my fiance and my anniversary dinner this evening. Hi! Two questions, first could like juice be substitute with let’s say lemon? Would it still make a tasty dish? Or other suggestions? Also, could milk in the sauce be substituted with soy milk? I made this tonight and yum!!! Absolutely love that it only used one pot and was super quick too. We had some veggies as a side and just put them on top of the chicken in the pot to steam.. save another dish! I found the lime lovely and zesty, will definitely make it again. Just wanted to let you know that my 12yo son followed your recipe and made this tonight… and it’s a absolute winner! We all loved it and I see this as part of our regular go-to meal recipes. The sauce was just super lovely… creamy, but not overly rich. Just divine! Am going to try this recipe out on my boyfriend and am sure he will love it–quick question though: what milk can i SUBSTITUTE (or, would you suggest) for the sauce–very lactose intolerant! Made this for dinner tonight and Though it was really good it waS way tOo limy. I think I shOuld have Used one LARGE lime instead of tHree because the avocado cilantro lime sauce was also Pretty limy with One large lime. My only SUGGESTION Would be to add a teaspoon of Chili powder For a touCh of spice. I overheard my nephew telling a friend he was eating the best meal ever. Love it when I hear younger children say things like that about new food! 😉 Thanks for the great input, Sherry! 1. Season the chicken with salt and pepper on both sides before browning. Make sure to get that chicken nice and golden brown. 3. Have everything prepped before you start browning the chicken – get the stock, lime juice, cilantro, and garlic ready and waiting. 4. If you’re too lazy to make the sauce, just add some sliced avocado at the end and garnish with more cilantro. It’s a great recipe and perfect for improvising with stuff in your fridge. Love it! So are you supposed to cook the rice first or just put the uncooked rice into the skillet with the rest? You put the rice into the skillet uncooked! Do you think one could make this in an instant POT? I haven’t attempted this but I think you could??! I would LOVE to hear the outcome if you do give it a try! I wish I’d read the comments earlier, because the amount of limes in this recipe made it almost completely inedible. We had to throw out the entire thing and just make frozen dumplings. Maybe would be good with no limes at all except the sauce. I don’t think I’ll be able to eat anything lime-flavoured for a while. It looked really good in pictures, and even smelled good when cooking and it came out looking about the same as in these pictures, but something must have been lost on taste.